Rustic Luxury. Just What You Were Looking For! When you arrive at this recently renovated, very private cedar cabin hideaway, you will find yourself away in the woodlands, but perfectly located halfway between both Yosemite entrances – so you can experience the unique beauty of each! Easy access summer and winter. So very cozy for a much needed retreat from stresses of daily life and the city. This rustic and very comfortable cabin has all the modern comforts of home plus more! You don’t have to settle for a musty older cabin. Valerian Retreat is a two bedroom retreat that features updated everything! Valerian Retreat is newly furnished. The kitchen has granite counter tops and newer appliances with all you will need to prepare meals … or not if you wish to eat in town. We have installed 2 flat screen TV's with Roku and Blue Ray player for your enjoyment after you return from the park. Complimentary Netflix movies are provided. There is also free Wi-Fi for Internet or a 'working' holiday. Cozy bedrooms and open floor plan with woodland view everywhere you look. You can sit outdoors on the patios and enjoy great sunset evenings most seasons. Dine indoors or outdoors and take walks around the grounds to enjoy nature. For those hot summer days or cold winter nights, there is central air conditioning and heating (a rare, desirable feature in such rustic homes, as opposed to the typical noisy bedroom wall units). The cabin is also the perfect hideaway in the fall, winter and spring. When it snows, the property, with its special setting, is usually covered with only a lighter layer of snow allowing easier access, while still providing our guests with that inviting and beautiful snowscape. If you need more space for a family reunion or get together of friends, we have a 40 acre property with the 3 bedroom newly redone Cottage Retreat - VRBO # 754978 - winner of over 60 Five Star reviews and the remarkable 2 bedroom Log House Retreat - Home Away # 2519215 - completed in November of 2017 with over 25 Five Star reviews. Peace and quiet are the best things you’ll notice when you stay at Valerian Retreat. It is set back just one mile off the main route 49, near the historic town of Mariposa and is half way between two entrances to Yosemite Park. You’ll want to sample both easy but different drives into Yosemite - either via the west entrance with HWY 140 along the valley floor beside the Merced River or via the south entrance with HWY 41 through the Sierra mountains. Valerian Retreat is owned by Cottage Retreats LLC. 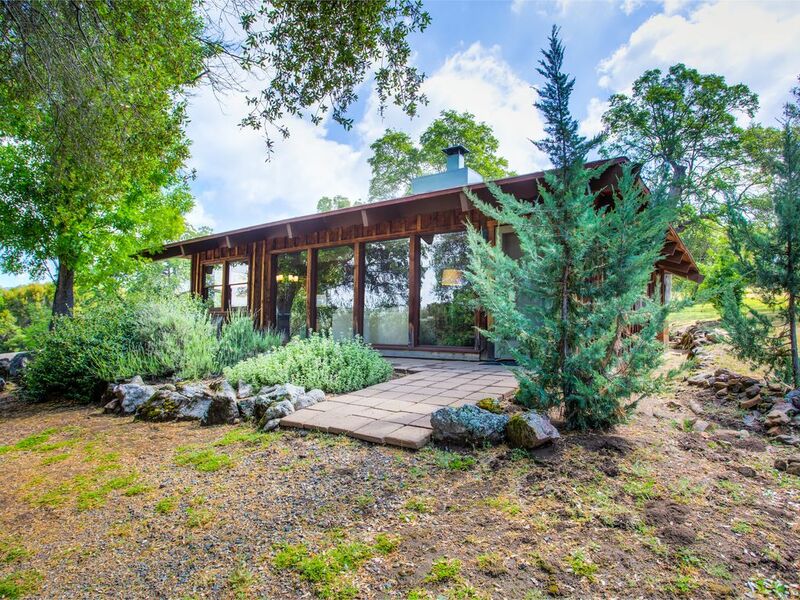 This property is unique as it sits so quietly and privately surrounded by 13 acre and 60 acre parcels on each side. Yet the main north-south road and a convenience store are only a mile away. This unique glass fronted home was professionally renovated, decorated and furnished to perfectly suit the peaceful rustic setting. View more about Ted B. Private quiet rustic setting among oaks, yet only one mile from main thoroughfare leading to Yosemite's entrance roads. The house is very clean and well suited in a secluded location. Comfortable beds, fully equipped kitchen, and homey design living room will make you stay absolutely memorable. Overall we were very happy with our stay. The beds and pillows were extremely comfortable. They had a washer and dryer, and some basic household items. We loved the property and the house it very easy to find. It’s very quite and we didn’t hear any noise. We also saw a some wild turkeys on the property. The town close by is very quaint and only about and hour and half away from Yosemite Valley. You will need to purchase garbage bags and (if needed) paper towels (they have ton of clean hand towels in replacement). Everything else was provided like shampoo/ conditioner, dish soap, clean towels, tin foil, laundry soap, etc. We absolutely loved staying at this property. It was rustic yet comfortable. The home was well kept and clean. We enjoyed relaxing on the patio and listening/watching the birds as they went about their business. We also liked the fact that we were a world away once we pulled in to the driveway yet close enough to town in the event we needed anything. I highly recommend this property and look forward to staying here again. Great place to stay surrounded by nature and no people!! I'm glad you had a nice time and everything was taken care of. I'm sorry about your inconvenience with the short absence of hot water. We had just converted from an electric to a gas water heater to allow our guests more rapid hot water. While we work to notify guests quickly, it can take a couple of hours in the mountains to arrange a service visit. Love the proximity to Mariposa and Yosemite valley. We thoroughly enjoyed the house and the wildlife. We loved the setting and were so comfortable in this lovely property. Everything was in order and awaiting our late arrival. The next day we awoke to the beautiful surroundings and nice big windows to bring in the view.